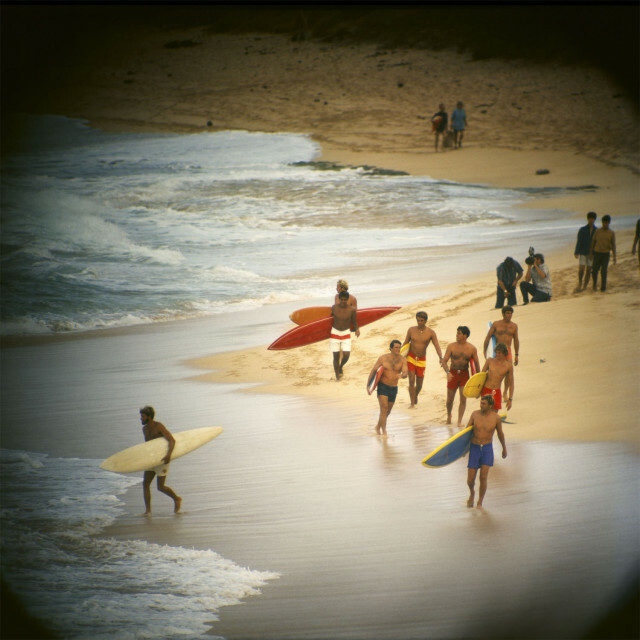 A surfer since 1931, LeRoy Grannis was born in Hermosa Beach, California in 1917 and began shooting surf-culture images on 22nd Street in Hermosa in 1960 as a hobby at the suggestion of a family doctor. His work immediately appeared in the important surf culture magazines of the time including Surfer, Reef and Surfing Illustrated, and he soon became one of the sport's most important documentarians. Grannis was voted into the International Surfing Hall of Fame as the number one lensman in 1966, and in 2002, he was awarded SIMA's Lifetime Achievement Award. He was the subject of The Surfers Journal's first ode to the master photographers in 1998 with Photo: Grannis; his work was featured in Stacy Peralta's 2002 award-winning documentary of the sport, Riding Giants; and in 2006, LeRoy Grannis: Birth of a Culture was published as a limited-edition, signed collector's edition monograph by TASCHEN. In 2005, M+B Gallery in Los Angeles gave Grannis his first art exhibition and since then, his photographs have been exhibited at galleries, art fairs and museums both at home and abroad, including New York, Los Angeles, Paris and London.